Blog - 3, 4, 5, and 6 carat Cushion Cut Diamonds That Will Make You Sparkle Like a Celebrity! 3, 4, 5, and 6 carat Cushion Cut Diamonds That Will Make You Sparkle Like a Celebrity! Who says you can't afford a big, natural, diamond engagement ring? With Hadar Diamonds cherry-picked selection of GIA certified, natural HPHT diamonds, top-tier sparklers are available to everyone... Even if you don't have royalties coming in from the latest blockbuster movie. A collection of celebrities, including Kim Kardashian, Jennifer Garner, Ashley Tisdale, Jewel, and Ivanka Trump all have one thing in common: The romantic cushion cut diamond engagement ring. This royal shape is reminiscent of romance and fantasy, combined with an elegant, traditional feel. We will let you in on a little known secret - you CAN afford natural diamonds with similar carat weight, color, and clarity characteristics as these celebrity engagement rings when you consider GIA certified, natural HPHT diamonds. Learn why sophisticated investors and collectors are choosing GIA certified, natural HPHT diamonds. This week, Hadar Diamonds is showcasing four gorgeous cushion cut diamonds in the 3, 4, 5, and 6+ carat ranges. With more sparkle than the Paparazzi cameras can handle, this 3.17 carat Cushion Cut diamond will make you the envy of all of your girlfriends. Watch the video to witness stunning shimmer and shine with its GIA certified VVS1 clarity and G color. Experience the best of all worlds with this 4.45 carat Cushion Cut Diamond. Fiery and brilliant with a top D color and exquisite VVS2 clarity, this sparkler will make you shine bright like the belle of the ball. For the woman who adores the classic square appeal of the cushion shape. Top measurements: 10.14 x 9.64 mm. As clear as water, the 5.27 carat Cushion Cut Diamond boasts a GIA certified Internally Flawless clarity grade. A choice selection for even the most discriminating taste, this beauty measures 13.21 x 9.40 mm. Video available upon request. With a lavish, rectangular shape, fit for the hands of a Queen, the 6.06 carat Cushion Cut diamond is set to impress. It's top measurements are 14.13 x 8.88 mm, with a stunning, GIA certified clarity grade of VVS2. Video available upon request. Want to out-do the Kardashians or simply own a diamond engagement ring like no other? 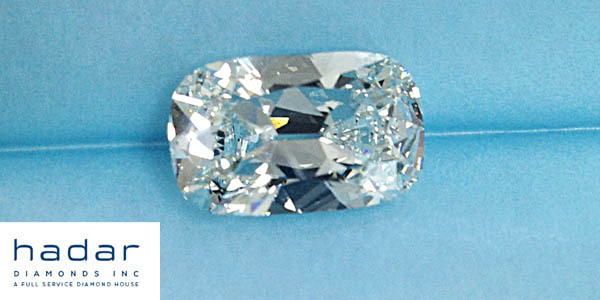 Compare this 23.51 carat Cushion Cut Diamond with Kimye's 15 carat cushion cut diamond. Hadar's prized 23.51 carat cushion flaunts a top-tier GIA certified E color, and VVS1 clarity. Price available upon request. Want more? Browse our exquisite collection of GIA certified, natural HPHT diamonds. You may also contact us via phone, email, or text to learn more.